A cash drawer is a basic piece of equipment yet a major part of everyday activities for many businesses. The right cash drawer combines ease of use for employees with security, durability, and well-featured record keeping – all while fitting into your budget. When choosing the best cash drawer for your business, it is wise to consider all of the particular needs of your specific business and accounting systems. Cash drawers are grouped into two basic categories, high duty and standard, with the main difference between the two being the durability and strength of the system. Heavy-duty cash drawers will withstand more opening and closing, will open and close more smoothly, and have a higher quality latch that is longer lasting and more secure. They cost more, but can handle heavier use. Heavy-duty drawers are best for any business where the drawer is opened and closed with great frequency, such as fast food restaurants, grocery stores, or coffee shops. Standard duty cash drawers are meant for lighter use, and as a result are less costly. Thought they will wear out sooner than heavy duty, they are still a good choice for a business that does not require frequent opening and closing. Small boutiques, bazaars, fairs, or companies that do more business over the phone or online than in person will do well with standard duty cash drawers. 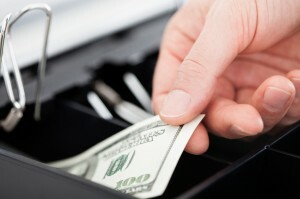 Security is one of the major considerations when choosing the best cash drawer. Businesses that deal in a large amount of cash daily likely will want advanced security features. Some of the security options available on cash drawers include locks on both the drawer and till and hidden compartments where larger cash deposits can be placed out of sight. For added security you can choose a drawer that opens only when a transaction is run. Heavy-duty drawers are often made of heavier materials, making them more difficult to break into, as well. Some cash drawers sit on top of a counter, while others can be mounted beneath the surface. Consider your space and what will best fit your situation. It’s also important to measure how far the drawer will protrude when open to make sure you have enough space. You will also have to consider the internal space of the drawer based on how much storage you need for cash, coins, receipts, and checks. If you are already using a specific Point of Sale (POS) system for your business, you should check to make sure the cash drawers you are choosing are compatible with that system. There are many different options for POS software, and not all hardware will be compatible, so double-check prior to purchasing. If you have a system that doesn’t open the drawer for credit or debit card transactions, you will need to choose a cash drawer that offers media slots. This will allow receipts and other media to be placed in the drawer while it is closed. Cash drawers range greatly in price, and if you need to buy many drawers this may affect your decision. If all of your business will be conducted through a single drawer, it makes sense to invest in a better drawer. For businesses needing multiple drawers, consider how much use each drawer will see before buying. Upgrade any drawer that is expected to see more use. A cash drawer is an investment for your business, so choose the one that meets all of your needs with the highest quality your budget will allow – you will save more in the long term.